Connor inviting Lori to stay at Number 30. 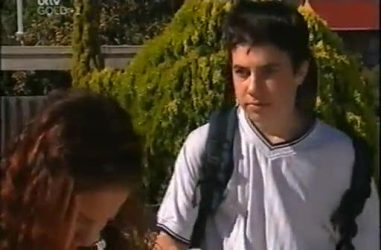 Stu telling Sindi that he doesn't think the email is from Toadie. Stu tells Sindi he's going to the station to show the cops the email. Sindi tells him about her former career as an exotic dancer, and that she doesn't think she deserves Toadie. Scott comes in and sees the email. Although Stuart tries to stop him he reads it. The next morning he is riding his skateboard around in the street. Sindi tries to talk to him, but he says he can do what he wants. After all, Toadie got to leave just because he wanted to. Serena says hello to him and he instantly kisses her then goes on his way without a word. Connor asks Stu if he's okay about Lori. Scott overhears the plan for her to stay in Toadie's room and isn't happy. Jack comes over and invites Lori to lunch. She accepts. Susan gives Scott and Serena's class an exercise on teamwork and listening to each other (the activity where you're in the desert and can only pick five things on the list). Scott instantly starts being a class clown, interrupting everyone, especially Serena. Lori and Connor decide who does the night feeding and other parenting responsibilities. Connor offers to get her a child care benefit, but Lori refuses handouts. Lori mentions her lunch with Jack and things get a little awkward. Scott finds the collage Serena made for him in his locker, and he tells her it's lame and throws it out. Susan comes in and tells Scott off. 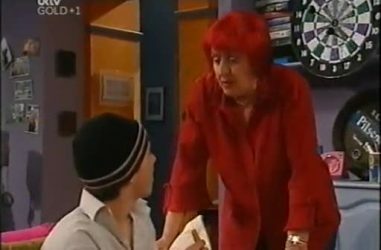 Sergeant Joanna Douglas visits and gives Stu a warning about his investigation of Toadie's disappearance, because Rocco has made a complaint. Stu and Connor talk about the warning he received. He now thinks Joanna is working for Rocco. Connor still doesn't think he was abducted and that Stuart's Joanna theory is farfetched. Angie (Toadie's mum) shows up to help in finding out what happened. While Susan helps calm down Serena and explain why he's behaving the way he is, we see Scott wagging school, going to a bin and dumping all his school stuff in it. He then sits down on a bench and starts crying. Stu and Connor argue about Toadie and Angie tries to find out both their opinions. Lori, Maddy and Jack enjoy their picnic lunch and reminisce on the fun they used to have. Jack asks if she really wants to move in with Connor. Susan comes home to find a mess and scented candles burning. Sindi apologises and starts cleaning up, Susan helping. Angie comes over and demands to know what Sindi has done with Toadie. Jack and Lori continue to talk about Lori's living arrangements. Lori insists it's for the best and Jack points out that she isn't saying what SHE wants. She tells him that it's best for Maddy and practical. She and Connor are friends, they'll make it work. Jack offers to go to New Zealand with her and the baby to start over. Sindi tells Angie about her career, and that Toadie's gone and it's all her fault. Angie refuses to believe that's why he left. She takes Stuart's side, but no one else does. Susan tries to keep everyone in order, and says that she thinks he's just gone off to clear his head and think things through. Connor and Lori argue about Jack's offer. Lori tells him that he would still be with Michelle if she didn't show up. Connor asks if she wants him to be in Maddy's life or not. Sgt Douglas shows Angie and Stu Toadie's credit card record. They still refuse to believe it because it's been used all over the place, but Douglas says it happens all the time. Angie tells Scott off for not being in school. She tells him he's coming back home with her, but he refuses to go. Connor comes and tells Jack to stay out of his business. Connor tells Jack he has no right to get back with Lori and raise the baby, because he hurt Lori last time. Jack tells him he wants to prove he's changed, but Connor tells him not to use his daughter to do so. 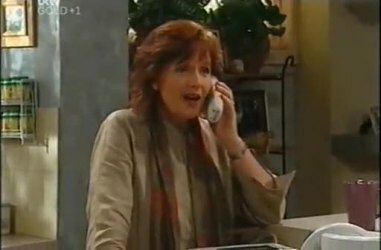 Libby calls Susan. Susan asks if she's talked to Karl yet, and Libby asks how Susan stays so strong through the separation. Scott leaves the house and bumps into Serena. He tells her he's gone in search of Toadie. Susan witnesses Scott hit Serena when she tries to stop him leaving.